A black bear succumbed to its wounds owing to the negligence of wildlife officials. It was attacked and wounded by hunting dogs in Sheikhupura. According to Syed Naeem Abbas, a local witness, the incident took place on Dec 24 near Eserke village in Sheikhupura where hunters from various cities had arrived to hunt wild boars along with around 50 dogs. While searching for the boars, they spotted a young black bear and besieged it at the canal where the dogs pounced on it. “I saw and got alarmed at the situation and tried my best to rescue the bear from the dogs and hunters,” said Mr Abbas. He said he called the World Wide Fund for Nature, the Punjab Wildlife Department and police to rescue the bear. The hunting parties wanted to hunt the bear, but he along with some villagers stopped them and told them the animal was government property as wildlife officials were on their way to claim it. 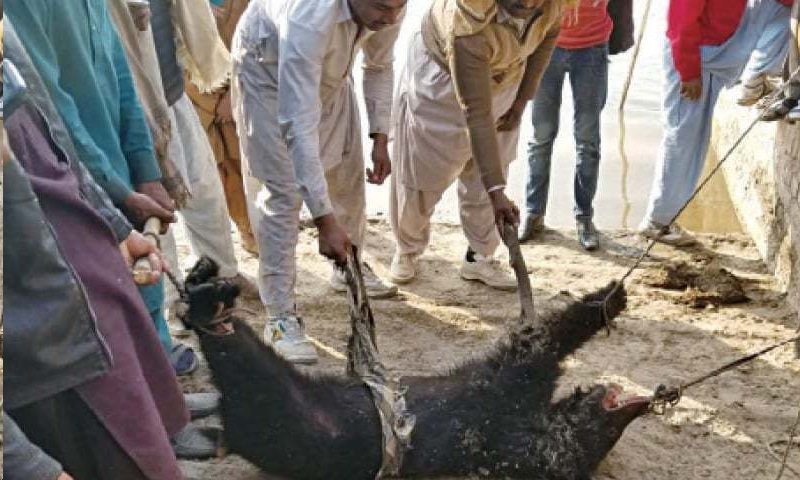 Abbas said the bear was owned by a man from Gujranwala, who reached out to him later telling him that he had bought the animal for Rs 100,000 and it had been missing for a year in the jungle. On the other hand, Amjad Farooq, the district wildlife officer, said that it was a wild bear and denied there was any nose ring on it. Narrating a different story from what Abbas shared, Farooq said the wildlife department had been unable to trace the owner of the bear. “The wild bear appeared from the border area,” he said, adding that its postmortem report was awaited. Lahore region Deputy Director (Wildlife) Zafar Shah did not have much information on the incident. He said that it could not be determined where the bear had appeared from, adding that nobody claimed its ownership as well. He was also unaware about the bear’s death on the way to Lahore, and said he would get back after confirming what had exactly transpired.